Enter PernixData. With FVP, PernixData offer clustered server side flash; fully integrated in VMware vSphere. It offers virtualization of the flash resources, making the flash footprint of a virtual machine available throughout the entire cluster. FVP, through its clustered architecture, offers fault tolerance and write acceleration as depicted in the image below. 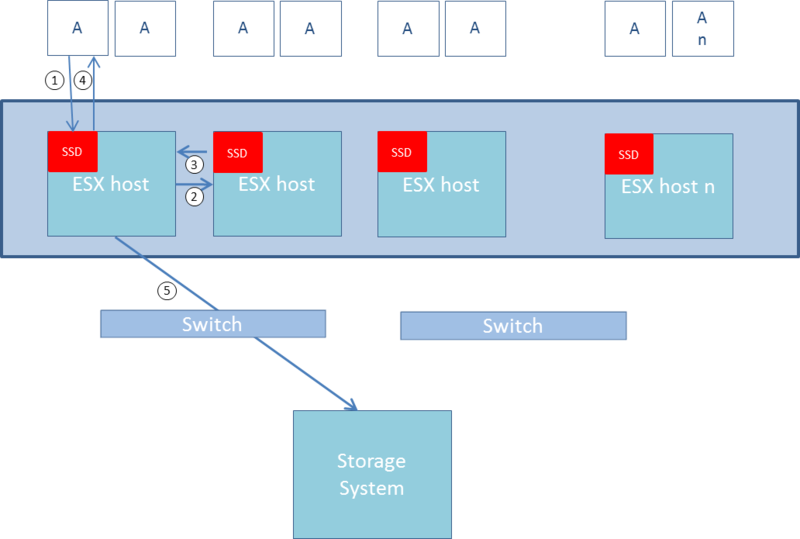 In the picture on the right, it is depicted how a write to the storage system is handled in a manner that serves both redundancy and performance. A write is executed toward the host (1) and then copied to a neighbouring host and acknowledged back (2-4), after which the write is destaged to the storage system. The key is that the (virtual) application does not have to wait for acknowledgement from the storage system (a matter of milliseconds) as a copy of the write is already saved in server flash of a neighbouring host (a matter of microseconds). 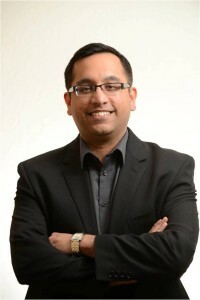 I interviewed Poojan Kumar about PernixData and their place in the market and learned much about the principles his company was founded on. What trends did you see in the market that led you to start this company? Going back a few years I was building Exadata for Oracle. Exadata was really about getting compute close to storage. Basically, offloading compute for particular applications – what we call bigdata now – taking query processiing and offloading it to where it belongs, close to compute. If you look what Exadata sold for it was basically for one thing, Performance. When we fastforward a few years and take developments in virtualization into acount, we see how that has changed the datacenter and currently we see server-side flash being ubiquitous. So now it is all about bringing storage close to compute. Flash in the server has been very popular in general in particular environments, like Facebook and Apple. They use flash in the server thanks to Fusion IO that has put server flash on the map. My co-founder and me saw that no-one was really using flash in the server in a virtualized environment. The biggest reason for that was; To do that requires one to build a platform that worked like VMware. One had to build a platform like Vmware that leverages flash in the server. This required VMware-like thinking around flash, which is exactly what we did to invent FVP. How will the trend of Storage moving to compute affect the centralized SAN storage model? The centralized model has come into question but still has a place. We believe that centralized storage model is still very good for certain things, and not so good for other things. It is good for having one place to scale your storage capacity, one place where all your data resides, one place for all your Data Services like snapshots. It is not so good for Performance. Customers are able to scale VMs linearly with increased compute resources, but the performance of your centralized storage does not scale along. The thinking is to get my performance out of my shared infrastructure, alow it to increase in a scale-out manner. It is about decoupling performance from capacity. FVP represents the first time customers can do that. What do you think about Diablo Technologies? They are the guys that place storage on a Dimm right? It’s awesome technology and I believe there is great synergy between these developments and our product. If you fastforward to what’s going to happen and already is happening – it’s is that vendors are placing flash in the server on a PCIe card. Another step further, Intel will be placing flash on the motherboard itself. Again we can piggyback on these developments, we are not attaching ourselves to one specific thing. This is how we see the future and it is actually the premise on which this company was started. Storage is basically going to be more and more on the server-side. We figured the right way to leverage this is not to build a lock-in architecture, not to build an architecture that tells people to get rid of their existing infrastructure. We really liked to build a VMware type of solution on anything existing, to approach the idea of being the VMware of the server-side. Let the folks on the hardware side like Diablo do what they do best, we can leverage that and we can actually enable them by building an ecosytem. What are you going to focus on for the next two years? We have worked hard to build what we can offer today, having said that we have a pretty agressive roadmap plans. Since we are seeing amazing traction from Entrerprise to SMB companies to the Service providers, we are planning to extend our product. We have plans to offer our product to multiple Hypervisors like Hyper-V, support blockstorage to iSCSI and FCoE but we take it one step at a time. What are your views on vSAN? Good architecture, I think the main use case might be VDI. The real question is what really enables a vSan archtitecture to come into existence: Combination of virtualization and server flash. The key is – how do you want to use the flash. Do you want to do it like we are doing it – not breaking your DR and your Data Services on your storage side. Does a customer want to be able scale compute and storage independently instead of tieing them together? The combination of server flash and virtualization allows you to do vSAN and PernixData. The question is, which is the right way to do it. I believe there are a certain set of applications where vSAN is relevant, but I believe the reality is that PernixData is able to do everything. I think our way of using server-flash and virtualization offers a lot more compelling reasons. What companies in the marketplace do you admire? I can think of companies like Pure storage, Nimble, also the architecture proposed by Nutanix is very interesting. All of them are trying to solve the problems by building a box – and we complement a whole bunch of them. There are many parties talking about the software defined datacenter and looking at the solutions out there, I think we are one of the few companies that are really delivering. Looking back on your career, which people have inspired you to get where you are now? That is a deep question. Peoplewise I think I am a real technologist at heart, I really enjoy technology. Exadata represented one of the most import times for me, I really had a great time there. A person that has been very important is clearly my co-founder Satyam that I have known from my Stanford days. An incredible amount of technology has been created by guys like him, and that really inspires me. I am inspired by people that want to build something that really changes the lives of people out there, not just our lives but doing something that has a big impact. Personally in the company I have been very fortunate to work with my co-founder and the team of great people we build up. Then we are also backed by some very interesting people like Mark Leslie who has build great companies from scratch and is obviously a huge inspiration, a great guide and mentor to the company. We have a great team of investors that believe in us, like Bipul Sinha from Lightspeed Ventures and Kleiner Perkins investor Mike Murphy. Then there are other advisors to the company are investors like John Thompson ex CEO of Symantec, Lane Bess ex CEO of Palo Alto networks. These are all people that believe in our company and at the same time have the credibility in the market because they set up enormous companies. Clearly you gathered a great team around you. How did you choose your investors and advisors around you? One common thing for us is to build a team around us of people who believe in us and the technology that we are building. We have been very fortunate to find very succesful people who believe in our mission. This is something that you see thoughout our company with people, they’re big believers. Another thing we look for in our company is something I like to call quiet confidence. Very accomplished people who are very humble at what they do. These are the things in people I have looked for so far. It’s one of those things, people have different motivations in starting companies. If you are not in there for a quick exit, then you need the right type of people. If you really want to do something for the long haul, if you really have a lofty dream, then you have got to surround yourself with the right people inside and outside. You need people with passion and that comes from belief. To me it’s about the people in the company, it’s not about FVP. Without the people it is a pointless thing. PernixData is about people who come together and make wonders. Wonders happen because of that, not because I think about some idea in isolation. That is very inspiring to hear Poojan. You also seem very happy. (Laughs) Yeah I am! There are going to be ups-and-downs, but if you want your destination to be great, all it is about is enjoying the journey and about doing the right things. Then everything will just happen, that is what I strongly believe in.